THE Federal Government has pledged $2.9 million, or half the proposed cost, to the building of infrastructure which will service the developing greenfield intermodal terminal at Yamala near Emerald in Central Queensland. The Central Queensland Intermodal Terminal site at Yamala, east of Emerald. To be known as the Central Queensland Intermodal Terminal (CQIT), it will handle containerised chickpeas, cotton and other commodities bound for export, and inbound containers including equipment for mining and agriculture. The funding was announced yesterday by Member for Flynn, Ken O’Dowd, and Minister for Regional Development, Territories and Local Government, John McVeigh. It will come from the Regional Jobs and Investment Packages. Mr O’Dowd said the announcement followed community input, which steered spending toward infrastructure and an export-focused training program which jointly are expected to create more than 60 jobs. “The Central Highlands Development Corporation (CHDC) will receive funding to partner with the Export Council of Australia, to deliver a multi-level training program to assist exporters at every stage of their development, from pre-export to expanding into new markets,” he said. “We will also see the construction of the $5.8m CQIT and Industrial Access Road at Yamala. This new infrastructure will allow containerised exports from the region rather than being transhipped elsewhere for containerisation. 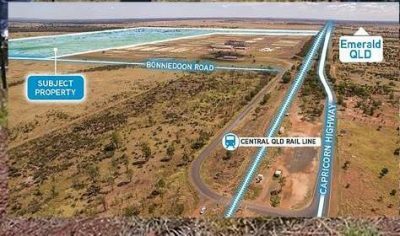 Mr O’Dowd said the funding, along with work already achieved by the Central Highlands Regional Council (CHRD), would help compliment a substantial road-to-rail interface to move grain to the port of Gladstone and reduce the impact on local roads. CQIT is part the Central Queensland Inland Port (CQIP) project, and much of the funding will be used to build a road which will access the CQIT and adjacent industry. As reported by Grain Central last year, bulk handler, GrainCorp is building its own facility as part of CQIP to store and bulk load grain on to rail for export out of Gladstone. The Queensland Government has lent support to CQIP by pledging investment into an upgrade of rail facilities at Yamala. Both Emerald cotton gins are potential customers for the CQIT, with LDC already located at Yamala. Colliers International is the agent for the sale of the land at the CQIP site. Click here to access details of the listing.